The Rev. 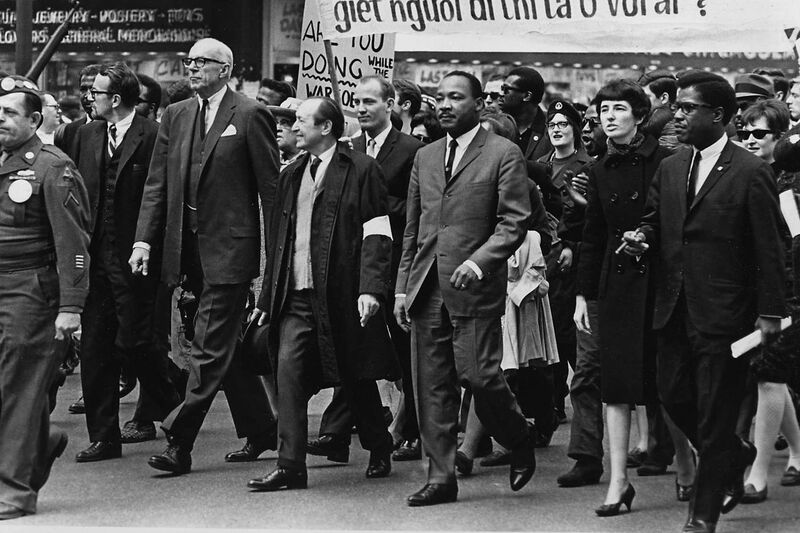 Dr. Martin Luther King Jr. (third from right) marching against the Vietnam War in March 1967 in Chicago. On April 5, 1967, editorials in nearly 200 newspapers across the country screamed their displeasure at the speech that the Rev. Dr. Martin Luther King Jr. gave in opposition to the Vietnam War before an overflowing crowd at Riverside Church in New York. Not in recent memory had so many editorials so quickly spoken in one voice of disapproval. King's speech the night before, "Beyond Vietnam - a Time to Break Silence," was delivered under the auspices of Clergy and Laity Concerned, of which I was the executive director. Joining King at the podium that evening to offer response to his presentation were Rabbi Abraham Heschel of Jewish Theological Seminary; John C. Bennett, president of Union Theological Seminary; and Henry Steele Commager, professor of American history at Amherst College. "A time comes when silence is betrayal, and that moment has come for me," King began. He made clear that he was speaking to his "fellow Americans" and then launched into a seven-point critique of U.S. policy in Vietnam, the impact of the war on America's low-income communities, and a recent review of U.S.-Vietnam history. He also spoke with great passion in support of draft-age men who had chosen to be conscientious objectors and those who were considering that alternative. That night he said he was particularly proud of the 70 Morehouse College men who had selected the CO path. King's speech on that cool spring evening 50 years ago still has significance for those with imagination. Some see a blueprint for future activists in his argument that "when machines and computers, profit motives and property rights, are considered more important than people, then the giant triplets of racism, extreme materialism, and militarism are incapable of being conquered." But I don't believe he expected his words would be part of a modern-day activist strategy any more than he expected there to be demonstrations against Birmingham's Bull Connor in 2017. Running throughout his Riverside speech (as well as many others), King was always careful to include all of God's people, brothers and sisters everywhere, in a worldwide fellowship. This kind of universalism was central to King and was the context in which he understood his own ministry. King quoted freely from Scripture, particularly the Old Testament, to underscore his belief, in Mahalia Jackson's words, that the whole world was "in God's hands." Failure to include this kind of universalism in a newly inspired King strategy for social change today would be to go on a fool's errand at best. If King could address us now he would certainly underscore the importance of the environment and human rights, and his analysis would include the red-blue state divide and the different role the United States is called on to play in the modern world. First, we are challenged to find ways to get out of our social and political silos. While it is warm, cozy, and often most convenient to be among those with whom we agree, it does not ramp up the health of our democracy over the long haul to loiter in such an insulated environment. Believe it or not, MSNBC and Fox News are not the beginning and end of life on this planet. One of the great losses of silo living is our immense capacity to objectify the other. As King shared with me in a personal interview in 1958, "Objectifying the other postpones the day for the society we want the most." Second, we need to get beyond identity, single-issue, and white working-class politics - all of which have been fueled by a society that is overly competitive and litigious. I am not suggesting that we turn our backs on issues or constituencies that are important to us. However, going forward, we all need to figure out new and effective ways to make common cause or compromise with those whom we have found it too easy to dismiss. Reinhold Niebuhr had it right: "We should be far less concerned with the purity of our actions, and far more concerned with the integrity of our compromises." Third, faith communities, too often either neutral or overly partisan when challenges abound, must commit themselves to the much harder task of being bridge-builders as they construct a new and deeper pluralism than we have heretofore shared. We see this work underway when Muslims raise funds to repair a desecrated Jewish cemetery, when congregations provide hospitality to Syrian refugee families, and when spiritual communities, as an act of strengthening their own faith, take on the long-term and rewarding task of becoming familiar with religious traditions not their own. "Now let us begin. Now let us rededicate ourselves to the long and bitter, but beautiful, struggle for a new world . . . so that we will be able to transform this pending cosmic elegy into a creative balm of peace."